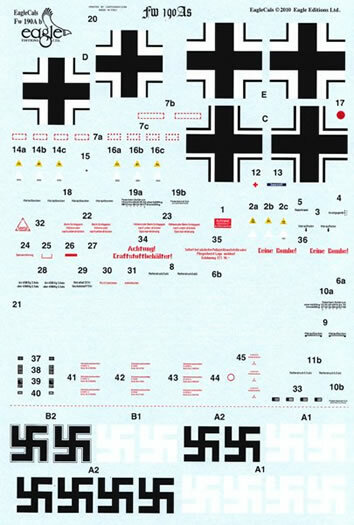 Advantages: Well researched with good attention to detail; excellent variety of subjects; decals in perfect register; minimal carrier film and a comprehensive set of stencil data. Conclusion: These sheets offer the early “Butcher Bird” enthusiast an ideal opportunity to replicate a subject other than those found in a kit. The quality of the product is undeniable and provides the modeller with everything they need for an accurate representation of their chosen aircraft. 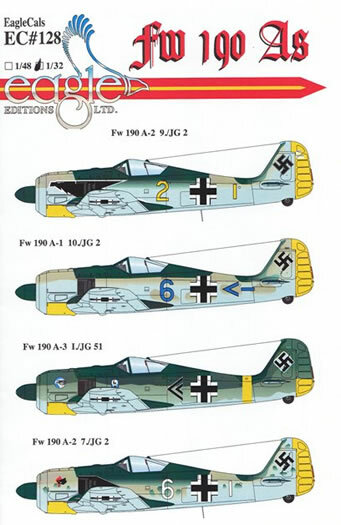 it’s just in time for the PCM Focke Wulf 190A kit. Each zip-lock bag contains two A5 sheets and the equivalent of 5 pages of instructions. The painting guides are clear and show views of top and lower surfaces where necessary. Importantly references are given for each profile, so that the modeller can judge the interpretations for themselves. Where publications are not quoted, EagleCals have thoughtfully included a photo or two of the subject in question. As expected from this company, the decals a superbly printed with a minimum of carrier film and perfect colour registration. If the latter could have been a potential problem, the item is provided as two separate images that can be overlaid by the user. A big bonus for the modeller is the inclusion of stencil data. Where more than one option is viable, alternate versions of these items are provided. The printing is clear and sharp, with the instructions leaving no doubt as to where everything should go. 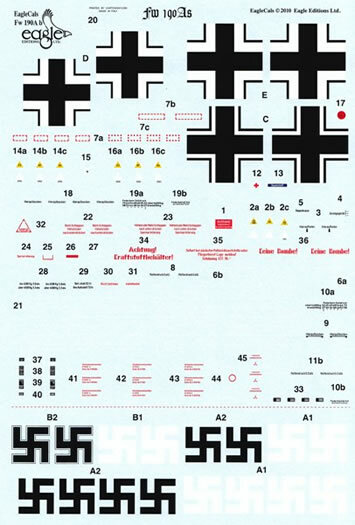 At this stage of the war, members of JG 2 were wearing a black and white Adlerflugel on each side of the forward fuselage. The rudder and undersurface of the engine cowl were covered in yellow paint with the former carrying a tally of ten victory bars. The first and last options on this sheet are the only ones to have their outboard guns intact. Being from a Jabo unit, one would expect to see an ETC 501 rack installed on this aircraft. Nothing is seen on the reference photo used for this profile but that doesn’t mean the aircraft wasn’t so equipped at a later date. As per the example above, there are no outboard wing guns on this aircraft. Is believed to be finished in the unusual combination of RLM 71/RLM 70 and RLM 76. Added colour comes courtesy of a yellow fuselage band, undercowl and lower portion of the rudder. The Hawk’s head of JG 51 appears on the port side only and this also applies to mountain goat emblem of I./JG 51. In common with the first two aircraft on this sheet, this machine wore an uppersurface camouflage scheme of RLM 02 /RLM 71 with the lower parts of the airframe finished in RLM 65. The A-1 style of canopy bracing is in place, as are the outboard guns and FuG 25a antenna. Another 4 options are presented here, with a good variety of schemes to choose from. 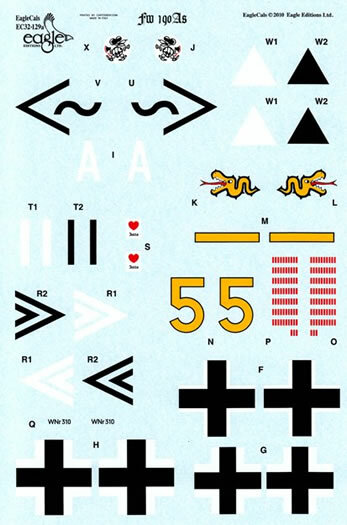 The package is essentially the same as before with two sheets of A5 material containing the appropriate markings and stencil data. Winter camouflaged “Butcher Birds” have always been a favourite amongst modellers. This one wears the expected yellow fuselage band and undercowl, as well as the repetition of this colour beneath the wingtips. No outboard guns are seen on this machine and it carries the ETC 501 rack in the early forward position. The unit badge can be found on both sides of the aircraft, which is quoted as being finished in RLM 70/RLM 71 with RLM 76 undersides. Yellow again makes an appearance under the wingtips, as well as on the lower engine cowl and around the fuselage. A change of camouflage can be seen on the next two options as RLM 75/ RLM 74 uppersurfaces and RLM 76 lowersurfaces are featured on the airframes. This one is further embellished with a red spinner and a yellow “Tanzelwurm” on both sides of the cowling. Fw 190 A-2, W. Nr. 310, “Black <<”, flown by Hptm. Josef “Pips” Priller, Kommandeur of III./JG, 26 Feb 1942. 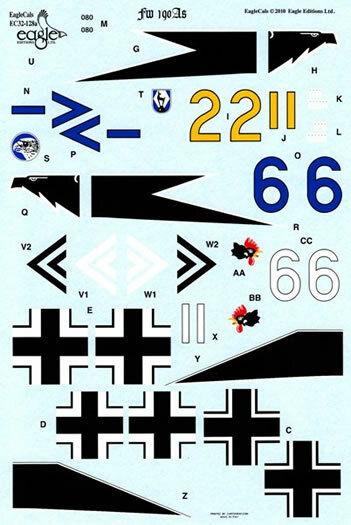 Priller’s aircraft is a “given” when it comes to decal sheets. There’s plenty of decoration to been seen with 73 victory bars on the yellow rudder and his personal emblem below the cockpit. The latter is a heart with a playing card and below this is written the name of his girlfriend. 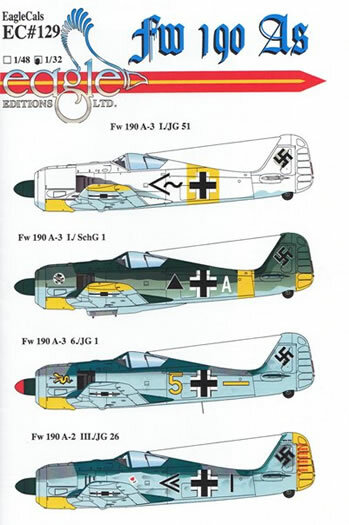 Compared to other versions, there aren’t a lot of alternate markings in this scale for early “Butcher Birds”. These sheets help to address the imbalance. The quality of the product is first-class and the accompanying documentation is also to be applauded. For those wanting a comprehensive set of markings for this famous aircraft, you can’t go past these interesting selections.